Go for glossThis industrial-style property really benefits from an unexpected flash of red to elevate its sober aesthetic. 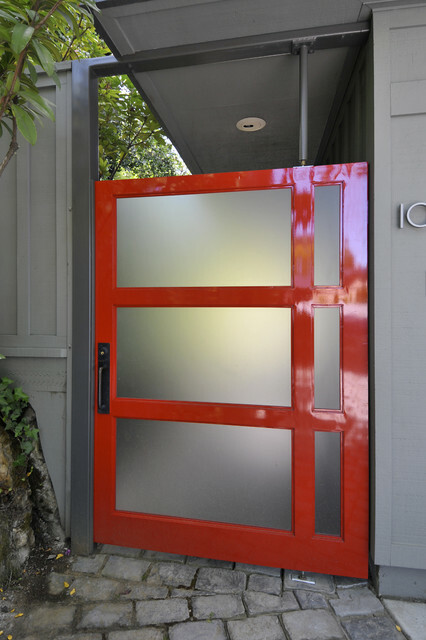 Add a lacquered gloss treatment for more punch plus a sleek and minimal finish.TELL US…Would you brave a red front door? Or have you done so already? Share your thoughts and photos in the Comments below. This gate looks about the right width. Like the fogged glass but I would want some clear mixed in. Looks pretty red/grey.